Great Christmas Stocking Suffer Idea ! These snowmen make a cute stocking filler. 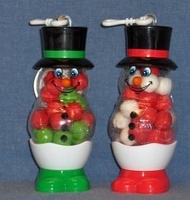 Each snowman is filled with candy snowballs. Eat the candy then hang the snoman ornament on your Christmas tree, or hang them with the candy in them on your christmas tree you kids will be surprised come christmas morning.